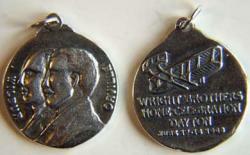 This is a very well handmade exact museum quality reproduction in Sterling Silver of the Wright Brothers School Children Coin for the 1909 Welcome Home Celebration June 17-19, 1909. The coin got this nickname because the schoolchildren of Dayton sold this coin for a nickel to raise the funds to have the homecoming parade. The coin was originally made from bronze and some were silver plated. This reproduction is sterling silver. The coin is 1 inch and has a loop on top for a wearing as a pendant as did the original.